I have this affliction or maybe you could call it a fixation with latkes. And I know you’re probably thinking, potato pancakes? With shredded onion? They’re good, but are they really worth obsessing over? 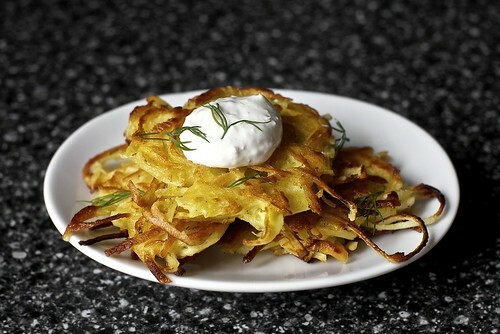 But you’d be using the literal definition of latkes and to me, latkes are not so much a singular recipe with a finite ingredient list but an approach to pancakes; an approach that could include anything that can be shredded and fried. And oh, when you start from this vantage point, they most certainly will. I’ve made potato latkes, sure. Many times, even. But then I made mixed vegetable latkes with Indian spices and curry-lime yogurt. I made apple latkes, replete with a caramel sauce made from the juice you wring from the shredded apples. (I waste nothing in the kitchen. My grandmother would be so proud!) This past summer, I made zucchini fritters to solve a dinner crisis. And now, there’s this: Parsnips. Potatoes. Dill. Horseradish. Lemon juice. I’m a purist. Potato. ‘Nuff said.